There’s an interesting barrage of films coming our way in 2015, and overall the picture promises to be less bleaker than it was in 2014. Although 2014 gave us quite a few interesting films which met with varying degrees of success, there are already a handful of films that totally have me psyched with their first look trailers. They’re not genre specific and you may have seen numerous tweets from me about them already but here they are in all their glory. Yeah obvs I’m talking about Jurassic World (I haven’t shut up about The Super Bowl spot in case you hadn't noticed), a creepy modern day whodunit Unfriended, The Fantastic Four reboot, which surprisingly, doesn’t look as pants as I’d imagined and the LOL inducing Ted 2 trailer which sees Mark Wahlberg’s fuzzy little friend return in a film that frankly, looks way better than the original. Essentially a festival film with a virtually unknown cast, Unfriended had its premiere in Summer 2014, but is all set for general release this spring. The film opened to decent reviews, and the trailer itself is sharp, smart and deeply disturbing. In what looks like a cross between Scream, I Know What You Did Last Summer and The Blair Witch Project, albeit with a modern twist, the plot revolves around a group of seven classmates, one of whom commits suicide after a humiliating video of her makes its way online. A year later the same classmates start a Skype chat which goes horribly awry when a seventh person anonymously logs in to the chat and starts threatening them with severe consequences, unless they don’t reveal the truth about the video. The premise of the film looks exciting and is very current given the dearth of smartphones and tablets we have at our disposal, and raises some pertinent questions on how as a society we seem to be abusing the wealth of technology at our fingertips. I’m on board for this social media nightmare which hits our screens this April. The first trailer, which released back in November was heavily criticised for its ropey CGI and the dodgy looking effects. The Superbowl trailer, however, seems to have brushed up on its CGI and as if that wasn't enough, the minute long trailer also gives us a further insight into the film’s plot (which decidedly seems to have been put together by a nine year old, but looks great fun nonetheless), and enlightens us on the film’s biggest threat – a genetically modified monstrosity that’s been created by park scientists in a last ditch attempt to boost a now fully functional tourist attraction’s dwindling profits. The new trailer gives us a peak at Irrfan Khan’s Masrani as well as a few terrifying shots of one pissed Indominus Rex, a hybrid that 'kills for mere sport'. The film’s trump card of course is Hollywood’s new blue eyed boy, Chris Pratt, who plays Owen, an expert dino-trainer, who goes all out to save the day with the help, of yes that’s right, a bunch of sneaky Velociraptors. One could argue that plot point alone sounds, preposterous, but I’m game. If you can create a genetically modified beast that lived 65 million years ago, why can’t you alter its DNA or train it so that it doesn’t attack humans? The new trailer gives several nods to the original, which if you’re a fan you’ll spot right away and it looks nothing short of terrifying. Haters may hate, but I’m on board for this summer popcorn ride that promises thrills aplenty. The park opens 12 June. Seth MacFarlane may have taken a critical drubbing for his epic dud A Million Ways to Die in the West, but he may be forgiven if the trailer of the sequel to 2012’s Ted is anything to go by. It’s outrageous, ridiculously un-PC and eminently silly, but has some laugh out loud moments particularly the one with Ted and Mark Wahlberg’s John wreaking havoc at a sperm bank. In the film, Ted marries Tami-Lynn, his girlfriend from the first film, and the couple try for a baby together. However, to have custody of this child, he has to prove to a court of law that he is human. The film’s female lead Mila Kunis has mysteriously disappeared and in place of her we have Amanda Seyfried who play’s the duo’s foxy lawyer. The film also stars Liam Neeson and Morgan Freeman in extended cameos, and looks all set to tickle our funny bones. Pass me the popcorn, I'll need a few LOLz come 26 June. Fox’s Fantastic Four reboot, which sounded awful ever since it was announced, seems to have redeemed itself somewhat, after its intriguing initial trailer. As is the case with most superhero franchises these days, they’ve done away with the campiness of 2007’s Rise Of The Silver Surfer, and have gone all Nolan-esque with its reboot which features Miles Teller as Reed Richards, House Of Cards’ Kate Mara as Sue Storm, Michael B. Jordan as the Human Torch – probably the most debated casting choice given that Johnny Storm was always blond in the source material, and Billy Elliot’s Jamie Bell as The Thing. The film returns to the origins of the fab foursome, and Chronicle director Josh Trank seems to have decided on a more sci-fi approach. Whether this works in his favour remains to be seen, but given that Chronicle was such a class act, Fox maybe, just maybe, have a winner in their hands. FF lands 7 August. 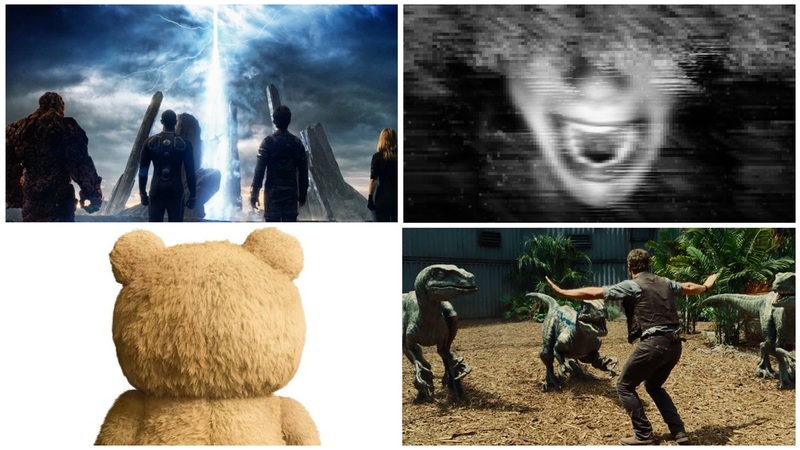 So... What did you think of the Ted 2, Jurassic World, Unfriended and Fantastic Four trailers? Are you on board?! Let us know in the comments section below!